These are remarkebly striking pannels for the interior decoration made from faux leather and dignified dressing for walls . In order to meet the diverse requirements of clients, we are engaged in providing a broad array of Designer Faux Leather Wall Panel. Sehrawat Brothers Interior & Decorators Pvt. Ltd. Since the day we have come into existence, we are highly engaged in offering 3D Leather Wall Panels. We offer Leather Wall Panel. Being a leading firm in this industry, we are offering a high quality range of Leather Wall Panel. We are offering a wide range of Leather Wall Paneling. We are offering Brown Leather Wall Panel to our clients. We are a leading supplier of WA034 Leather Panels. Leather Highlighter are the thin layers of leather material that are bonded together with laminate craft paper to make a durable sheet. These are mainly used in bed wall paneling, home theater wall paneling and for other furniture elements. 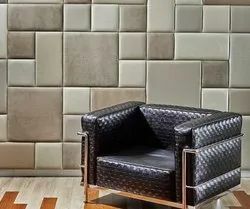 We are engaged in offering our clients a wide range of Leather Wall Paneling. The offered panel is precisely designed using the topmost quality leather and modern techniques under the surveillance of our skilled professionals. These products are available in different designs and sizes as per the choice of our clients. Product will be 16 "